I'm starting off my countdown of red, white and blue desserts for the Fourth of July! Starting off with Cherry Pie! I’m not big on baked cherries, so I thought we’d see what happens if you make a cherry pie just like you would a fresh strawberry pie! It’s Tasty! I love the buttermilk crust. It’s becoming a favorite! As seen on Photograzing. My mama’s been in town and one thing my mama has wanted to do is go and pick berries. When I’d told her that Butchie and I went strawberry picking she was incredibly jealous. Since we’ve already done all the touristy things in DC, it was an easy call! We drove out to Butler’s Orchard to go pick some strawberries. Awesomely, there were cherries and peas to pick too! I was hoping for blueberries but I’ll have a wait a few weeks for those. I’ve already started plotting. Combine flour, sugar and salt in large bowl. Add butter. Cut in using hands or pastry blender until mixture resembles coarse meal. Add buttermilk and stir with fork until moist clumps form. Press together to form dough. Divide dough in half. Gather dough into balls; flatten into disks. Wrap separately and chill 1 hour. Place a piece of parchment paper inside the pie shell. Bake at 400°F for 8 to 10 minutes, or until the edge are golden brown. Remove the weights and parchment after 5 minutes of baking. Buttermilk pie crust or your favorite! Roll out dough and mold into either a 9 inch pie pan or a rectangular tart pan as I used. Bake as you normally would for your pie crust recipe. 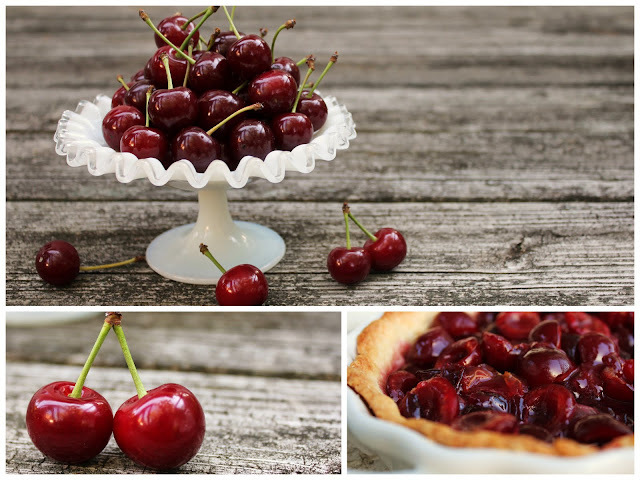 Pit the cherries, then arrange most of them in the baked crust. Leave out about 1/3 cup. Mash remaining berries, and combine with sugar in a medium saucepan. Place saucepan over medium heat and bring to a boil, stirring frequently. In a small bowl, whisk together cornstarch and water. Gradually stir cornstarch mixture into boiling the boiling cherries. Reduce heat and simmer mixture until thickened, about 10 minutes, stirring constantly. Allow to cool slightly and then pour mixture over berries in pastry shell.